Screenshots World of Tanks Blitz | WoT Blitz 5.9 - Fan Site! Hello everyone, Very soon will be released update 2.3. 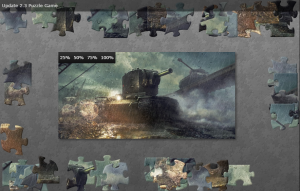 Well, while you’re waiting, you can fold the puzzle and see the teaser of the new update. Commanders! Location Map “duct” divided the river into two parts, which are joined by two bridges. Today, March 19 opened set in the Closed Beta Test. In honor of this event, developers showed several new gameplay screenshots.